This article comes from the teaching notes of Tallyrand which he gives to his student chefs when he finally lets them loose on making breads! How to make your own bread makes for most interesting and informative reading but if at any time you need help or advice or would just like to make a comment feel free to email us. A brand name for a mixture of active dry yeast and bread improvers (dough conditioner and nutrients), these stimulate the yeast activity. Because of its make up it is able to be blended directly into the dry ingredients during bread making. If the recipe calls for dried yeast, substitute double the amount of Surebake. This has a limited shelf life and is best used only for products that either require an extensive preparation or very slow proving. If the recipe calls for Surebake, substitute half the amount of dried/active yeast. Never over prove, double the original size is the maximum or the dough will spoil. When placing breads in the oven ensure they are placed on the middle shelf, and checked after 5 minutes. Cover with tin foil if required to prevent further browning. The herbs and spices can also be replaced with other flavourings as required such as nigella seeds, garlic, etc. Briefly knead again and divide it into eight even pieces; this is best achieved cutting in half, and cutting each half into half again and then repeat – this way all pieces should be the same size! Most domestic / retail brands are slow acting in that the dough, batter, etc may require being rested to allow a fermentation process to take place before baking, frying, etc. As the baking soda is a alkaline, when combined with the tartaric acid and a liquid it begins to ferment, forms CO2, and thus allows products to aerate. But the very thing that makes baking powder work also makes it unstable and gives it a short shelf life, as eventually the two chemicals cancel each other out. When this happens the baking powder is dead and any scones, etc made from it will not rise. Purchasing the two chemicals separately and making your own baking powder will greatly increase the shelf life and always ensure you have a good, workable baking powder. Alternatively, purchase baking powder in small amounts and use frequently. Baking soda can also be used as a raising agent (as for Irish soda bread), in this case buttermilk is normally used (or milk with a small amount of vinegar added). This acidity activates the alkaline of the baking soda to produce CO2. This recipe was provided by Tallyrand in response to an email enquiry. Knead for 20 seconds on a floured surface. Divide the dough into 400 gm round loaves. Put them on a sheet pan. Dust the top of each loaf with flour. Press a cross into the top of each loaf with a sharp knife. Do not cut completely through the dough. Bake the loaves at 220ºC for 30 minutes, or until browned and cooked through. Sour dough bread is made by making what is known as a ‘starter’ - this is flour and water mixed to form a soft, slack dough and leaving it for a week prior to requiring the bread. 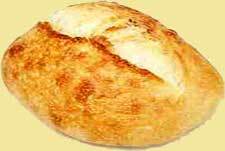 This ‘starter’ is used as the rising agent and was the basis of breads for hundreds of years in many cultures. It uses the natural yeasts found floating in the air, that are captured by the starter dough. Lost to many countries over the years with the advent of yeast, it is now again making a comeback. Although, as many countries that there were which lost sourdough breads there were others that maintained and embraced the loaves. Maybe it was for the cultural significance, maybe the traditional, maybe it was the exceptional taste of the loaves over yeast breads. Whatever the reason sourdough breads are back with us in an ever increasing big way, which this chef is more than pleased with. This is the bread many of our ancestors / forefathers were used to, the style of bread referred to in the Bible, the bread the ancient Romans marched on their bellies on and conquered the world with, it is simply the bread of legend. People who have experienced my sourdough breads, those that have had it in restaurants or specialist bakeries rarely go back to store bought yeast breads. Sourdough breads have a wonderful smell, a crispness of crust and a chewy texture and body that can only be described as pleasurable to the point of being illegal, supermodels would kill for such body! It is so easy to make and the finish of one loaf means the automatic start of the next - as you will see from the following recipe. But it does require patience and time initially. 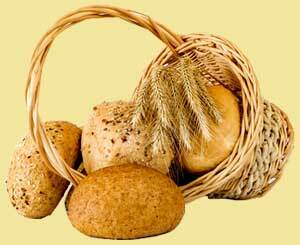 If you want to make a loaf every day, you will have to start by making a starter every day of the week for a week. Labelling them so you remember which was made on what day and then using that starter to make the bread on the corresponding day the next week. Sounds complicated and a lot of fuss, but it isn’t and you will love the initial effort and it is worth the wait for the first loaf . . . if you can wait for Xmas once a year, then a week for a great bread loaf is not too much to ask. Place in the oven for about 10 minutes, turning once, to finish cooking. Serve right away topped with sour cream. Enjoy your bread making and bon appetit . . . . .